Hi, I'm Kawamoto of the Software Design & Development Department. Just like in the News Channel, I also worked as the director of the Forecast Channel. I'm Matsushita from the Software Design & Development Department. I was responsible for the design, like the Globe and the screen that displays the weather information. I'm Suzuki of the Software Planning & Development Department. I worked as the liaison between our staff and the forecast information provider. Like the News Channel, the Forecast Channel was going to be launched simultaneously in Japan, US, and Europe, so I also worked as the liaison that coordinates between each of the countries. I'm Fujikawa from the Research & Development Department. I made the system where the forecast information sent to us from the weather provider gets distributed to the Forecast Channel. The Forecast Channel was developed with almost the exact same staff members as the News Channel. The News Channel was originally developed from the concept that we wanted to get people who would usually not play games to have a chance to use Wii. The Forecast Channel was created from the same concept. Like the News, the weather forecast is also something that you can easily get on TV and the Internet, so we first started by trying to differentiate between these services. 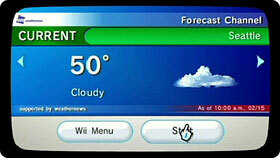 As a way of giving the Forecast Channel a look that's distinctive to something that can only be done on Wii, displaying the forecast information using the Globe was there from the early stages of development. In that way, it has the same roots with the News Channel. But early on when the Globe was first implemented, it just looked like a web page with a globe that displayed all the forecast information around the world. This eventually evolved into the TV-like interface that it is today. 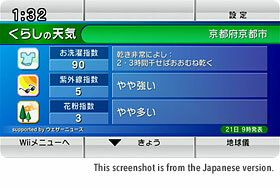 Since Wii's original concept was to add more channels to the TV, displaying a clock on the upper left corner of the screen1 was an obvious choice. When we thought about how it would be used in a busy morning, we felt adding the clock was necessary. Because we were thinking how it would be used in those busy moments, we also wanted to shorten the time it takes to display the forecast information as much as possible. This is something that can only be made possible by the WiiConnect24 correctly distributing the information ten out of ten times, so instead of having all the Wiis connect to the same server, they download the data by connecting to a server near their location, resulting in a much faster download. It was a lot of work organizing all the forecast information around the world, but compared to the News Channel which has multiple news sources, the Forecast Channel was easier to develop in a way that there is only one forecast source that provides the weather worldwide. The problem we faced was that if it displayed the wrong forecast information, it was difficult for us to know that something went wrong. Right, things like the display timing of the chance of rain. Those things are hard because you can't tell that it's not right unless you really take a close look to investigate. If it happened during the day, one of the developers can try to check the accuracy by comparing it with the original weather, but it's not that easy when things go wrong in the middle of the night...During development, there were some close call like the time one of the developers happened to come in early one morning who just happened to find something going wrong. Whether it's the news or the forecast, I felt that we were working with information that had life. All these issues do not come up when you're developing a video game. Since forecast information is something that shouldn't be joked around with, you're not able to put in too much of a fun factor in it. We did, however, put in features like where you're able to grab the Globe and spin it around, giving you a more interactive feel to the interface. I usually find myself turning the Globe, too. As you turn the Globe, you keep looking to see what the weather is like around the world. Like the temperature on the South Pole, and the weather in Everest. I look at the forecast of places that I would never check if it was not for the Globe. We actually had many discussions about what places around the world should be displayed on the Globe. Basically, we put in all the names of places that would be on a regular globe. Then after that, we received request from other countries to add in places that were not there, and we pretty much put in everything that we could. The names of places that are displayed on the Globe are different depending on what country you're in. For example, if you're in Japan, a lot more cities in Japan will be displayed, and if you set the country of the North American version of Wii to the US, the Globe will display several hundred cities across the US. The picture of the world on the surface of the Globe is based on accurate data provided to us by NASA. This may be a good place to learn your geography. While we were developing the Forecast Channel, I was very surprised when I found out how much of a cultural difference there was between Japan and overseas, about the way people view their forecast information. 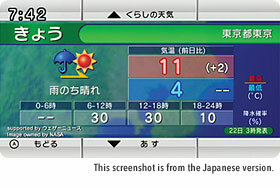 The most notable one, I think was when we were requested by NOA (Nintendo of America) that the current weather information had to be included in the Forecast Channel. Being Japanese, when I first heard that, I couldn't help but think "But why can't you just look out the window?" I asked about this many times, but they told me that it absolutely had to be there. I actually worked with some doubts in my mind, wondering if it was just the person that I was talking to felt this way, or if everybody in the US actually felt this way too. As a result, in the US and European versions, the current weather information is the first thing that appears when you start the Forecast Channel. With the weather icons, I thought that it was an international standard that the sunny icon was a red sun, the rain icon appears as an umbrella, and so forth. But when I saw the documents that were sent to us from overseas, they looked completely different. From clouds that looked like it was taken from a photograph to the brightly shining sun, everything looked photorealistic. There were also types of weather that are not found in Japan. I felt that it was not possible to make the icons universal, so we made two sets of icons, one set for Japan, and another set for overseas. 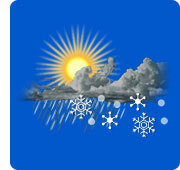 In the oversea icons, some of them are a combination of the different weathers. One looks like the sun, cloud, and snow overlapping each other...In overseas, I hear that they actually do have times where it's partly cloudy yet it's sunny, and it snows occasionally. We also had a request from Europe asking us to clearly differentiate between hail, graupel, and sleet. When I mentioned to them that when those icons were made, they really wouldn't look that different from each other, they responded by saying "No, it's different, so please change them." There was also one for haze. 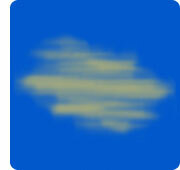 We never see a weather icon for haze here in Japan, so I had to request samples on how they were supposed to look like. 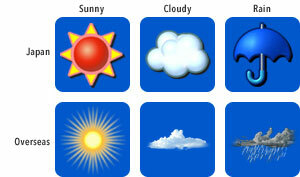 In that sense, even deciding on the weather icons was done through a process of trial and error. In designing the screen interface, the layouts aside from the forecast information became very different as well. You just cannot do without knowing what the chance of rain is in Japan, but you don't need that information overseas. They said that all the information they needed to know was whether if it is sunny or cloudy, and the temperature. The type of information that we think is important is completely different. Overseas, there isn't such thing as a laundry index.2 When we first mentioned the term, they replied by saying something like "What in the world is a laundry index?" Up to that point, I thought that the laundry index would be important information in other parts of the world, too. Maybe since it's less humid than Japan, clothes dry easier. In the end, it turned out that the UV Index was the only thing that remained. But since we weren't able to add too many variations because we were working under a file size limit, we tuned it so that as much countries as possible could use the same components. So it can be better accepted by people living in both Japan and overseas. In the sense that I learned how to see things from a global perspective, it was the perfect job! (laughs) Speaking of global, in the just released Everybody Votes Channel, you can tell how differently other people think around the world. I'm also involved in the Everybody Votes Channel, and the very first worldwide poll received more than 500,000 votes. I was very happy to see it received this many votes, especially since it has only been two days after the Channel launched. But as the person responsible for the servers, it's actually a happy and a nervous experience at the same time. 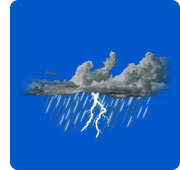 What was memorable was the thunderstorm icon requested by NOA (Nintendo of America). It's a storm that's accompanied with thunder, which was a little hard for us to understand because here in Japan, we don't see the weather where it's only thunder. Thunders are usually mentioned in addition to when it rains, as if it's going to rain with occasional thunders. So I didn't think a weather icon just for thunder was necessary, but it seemed like a thunderstorm was different from a regular thunder, and as I was wondering what the difference was, they kept insisting that it was very important for this to go in. Right when we were talking about that, a thunderstorm actually hit Seattle where the NOA (Nintendo of America) headquarters is located, and the situation turned very bad. They were out of electricity for several days, and we weren't able to get in touch with them. This happened right in the final phase of the development of the Forecast Channel, and as I was wondering why they weren't responding to my emails, I finally got one saying "We're working under candlelight. When this laptop's battery runs out, I will not be able to contact you..."
I don't mean to be rude, but while I was actually wondering if it was that much of a big deal, the news about that thunderstorm came into the News Channel that was still under development. It was a big disaster, with trees falling, tens of thousands of households were without light, and it took days for the electricity to recover. As I was watching that, I realized how much of an impact it really had. A similar thing happened in Europe right before the launch of the News Channel. A big rainstorm that was unseen in decades hit northern Europe, and we lost touch with everyone in NOE (Nintendo of Europe). Right, everybody stayed home due to the severe wind and storm warnings in the Frankfurt area. That also showed up on the News Channel, and when I saw that, I realized that these events were actually happening, and how terrible the situation was. The sense of connection we had knowing that the people we directly work with were being involved in these news events made a really big impact. That was when I was reminded that this is live information that we're dealing with, and we're handling vital information that's very close to our everyday lives. Looking back at the Forecast Channel from the design perspective, it turned out looking really different from the way it looked early on. When we just started, it didn't have the Globe, and all it displayed were today's and tomorrow's forecasts, so it really felt more like TV broadcasts and websites on the Internet. But around that time we were thinking about how what we're making now is really not what we wanted to make. As we were trying different things, the idea to make it look like a TV program also showed up here as well. When the TV concept came up, we then wanted to make it so that you could get the exact information you wanted just by taking a quick glance at the screen. When we realized what was the main information that we wanted people to see, we were able to cut out all the other elements that were not necessary. Matsushita-san also worked on the design of Brain Age for the Nintendo DS. The way that game displays your brain age in big bold print, feel somewhat similar to the way the Forecast Channel displays the temperature, like "25C". Speaking about a TV-like design, there's a clock on the upper left of the screen. That went in because I wanted to get as much people as possible to see the Forecast Channel as something that they could relate to. I hoped that could be their first step in interacting with Wii. For example, if we can have Mothers wanting to power on Wii, that would make me very happy. I have a friend that turns on the Forecast Channel during breakfast just to check the time. Apparently, TV shows distract him from eating because what's going on in the show gets too much of his attention. But he can focus on eating if it is the Forecast Channel, because the only information that is displayed are the time and the forecast. Until I heard that, I didn't realize that it could be used in that way. Aside from the clock, the background music also changes depending on the time. It feels very different depending on whether it's night or day. At first, all we had was the Night Song. It's a great song, but it is an easy, healing song, and it can make you feel sleepy, which I thought might not be a good thing in the morning! (laughs) So then I requested that the Day Song to be made. The easygoing song will play from the afternoon to the morning. The Slide Show feature in the News Channel has a similar feature where a slower song will play at night. I might have gone a little too far in paying attention to these details. Well, I do feel that in order to blend Wii naturally into people's everyday lives, I think how much thought we put into those things is important. If it's something where the people feel that just doesn't fit in with their lifestyle, it will end up not being used. That reminds me, there's a feature we tried out after the release of the News and Forecast Channels from the feedback we received from both inside and outside of the company. It's actually cute when it reads the kanji characters wrong. Like the way it reads the name of the actress Kiki Kirin as "Jyumoku Nozomibayashi-san". We also received suggestions that you should be able to register one or two more places besides where you live. 1. Clocks are displayed by Japanese TV stations during morning hours. The clock is displayed 24/7 in the Japanese version of the Forecast Channel, so the Channel has a closer feel to a Japanese TV weather show. 2. Laundry Index lets you know how appropriate it is to dry your clothes outside that day. 3. Kanji characters can be read two ways, for example, the kanji for "water" can be read as "mizu" or "sui". Interpreting how a kanji is supposed to be read for a name is very difficult.